I saw a post on Tanner Foust’s Instagram about his participation in a cross-country trek. He’d be participating with a team from CLP Motorsports, a race shop out of the Bay Area, driving a VW Diesel Powered Superlite Racecar 2,400 miles from Florida to California, along I-10, on one tank of synthetic diesel. 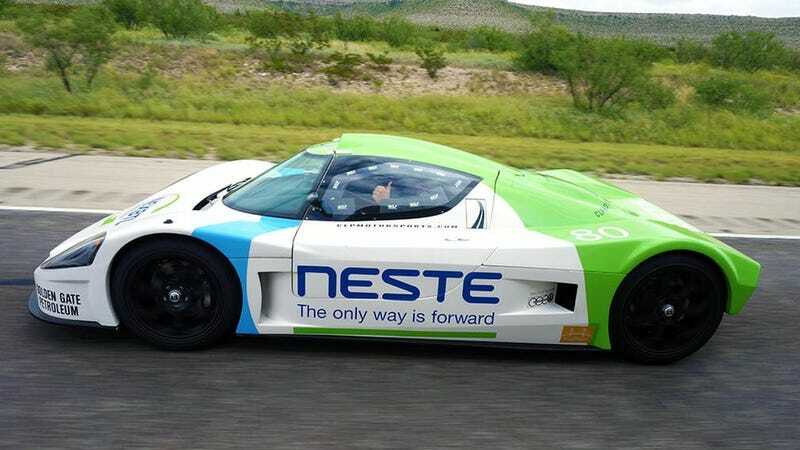 It’s being sponsored by Neste US, a company that manufactures the synthetic diesel, and, possibly Volkswagen, since it seems that they were the ones who offered up Tanner. The team would be taking stops along the way, and would complete the drive in a few days. Apparently they left on Sunday, and are currently, as I type this, somewhere in West Texas. So, Racecar + BioDiesel + VW TDI motor + One trip across the USA. Cool, huh? But here’s the kicker. Just how big is that tank? No one seems to know. None of the press releases list the details. I get it, the press is going to list it as a “One Tank Trip”. It’s a good headline. But wouldn’t it be a better headline to talk about the drama of only having 10 gallons? or 20 gallons? I’ve tweeted @CLPMotorsports asking about this, to no reply.